A plot which could have easily been about an uncertain wailing-whining helpless woman, becomes a story which narrates the emergence of a strong woman. Rani is a good student who learns from her own experiences. She realizes that she is bold and courageous. She is funny and witty. Her transformation from a dependent girl who cannot even cross road without holding someone’s hands to a bold lady who can independently think and make decisions is splendid. Of course, it is very gradual, hence, very believable! The screenplay flows with ease. Even the flashbacks involving Rani and Vijay comes in the appropriate places. In spite of the length being close to 2.5 hours, there will not be a single boring moment! The dialogs are so real and very “normal”. I even noticed some places where Rani stammers to correct the diction and make it sound better. Come on, we do it all the time. Nothing comes flawlessly unless rehearsed. And those dialogs that comes across as Rani’s mind-voice in the beginning of the movie and those she says after getting drunk are too good. 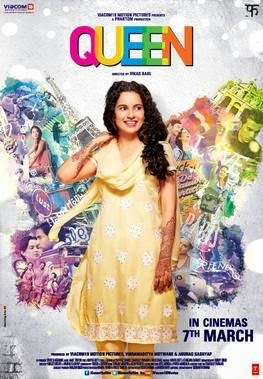 Kangana Ranaut, as Rani, is brilliant. From the dresses she wears to the expression she gives are so realistic. How can I not mention the way she bats her eyelids on seeing a flimsily dressed Vijaya Lakshmi (Lisa Haydon). Also that scene where she swallows and tries to distract herself when she witnesses a lip lock between Vijaya Lakshmi and her boyfriend. None of the songs are misplaced and it blends with the background. There is not a single scene that would embarrass you or make you feel uncomfortable. Not even that “Pole Dance” scene! Special appreciation for coming up with the Facebook timeline for subtitles. It is different and yet relatable. I loved Taka (Jefferey Ho), Rani’s Japanese room-mate. A strange kind of brotherhood build between them. Rani talks in Hindi and Taka in Japanese, yet they understand, they connect emotionally. In short, the story is wonderfully made. Rani will certainly influence us and she will always remain in our memories like how Geet of Jab We Met refuses to leave us! looks like an awesome movie, can't wait to watch and you have an awesome space here. It really is a fun movie..